The great northern bean is a large white bean that resembles a lima bean in shape with a delicate distinctive flavor. 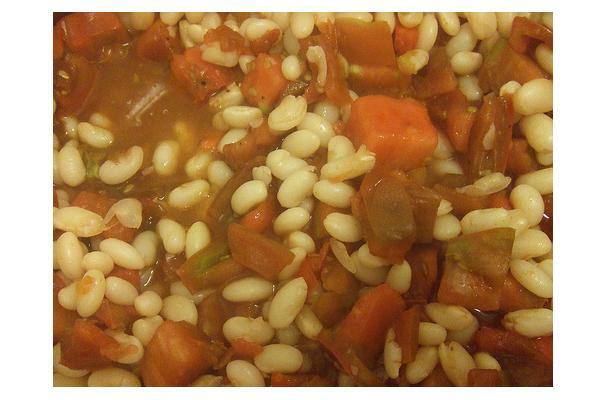 Great Northern Beans are a delicately flavored white bean related to the kidney bean and the pinto bean. The common bean is a highly variable species with a long history. Bush varieties form erect bushes 20–60 cm tall, while pole or running varieties form vines 2–3 m long. All varieties bear alternate, green or purple leaves, divided into three oval, smooth-edged leaflets, each 6–15 cm long and 3–11 cm wide. The white, pink, or purple flowers are about 1 cm long, and give way to pods 8–20 cm long, 1–1.5 cm wide, green, yellow, black or purple in color, each containing 4–6 beans. The beans are smooth, plump, kidney-shaped, up to 1.5 cm long, range widely in color, and are often mottled in two or more colors. Choosing: Select solid beans with no blemishes, should be firm to touch. Dried beans are almost always cooked by boiling, often after having been soaked for several hours. While the soaking is not strictly necessary, it shortens cooking time and results in more evenly textured beans. In addition, discarding one or more batches of soaking water leaches out hard-to-digest complex sugars that can cause flatulence, though those who eat beans regularly rarely have difficulties with flatulence as intestinal microbes adjust. There are several methods including overnight soaking, and the power soak method, which is to boil beans for three minutes, then set them aside for 2–4 hours, then drain and discard the water and proceed with cooking. Common beans take longer to cook than most pulses: cooking times vary from one to four hours but are substantially reduced with pressure cooking. History: Other white beans include Cannellini, a fairly popular variety in Central and Southern Italy which is related to the kidney bean and like the kidney bean has higher levels of the toxin lectin (Phytohaemagglutinin). A notable Greek type of giant white beans exists, called yiyantes or gigantes (Greek: γίγαντες). They are produced in a specific part of northern Greece (protected label) but can be found throughout the country.